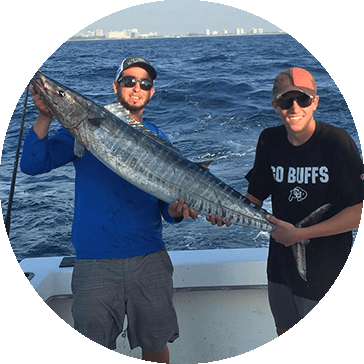 When fishing for Wahoo in Florida with YB Normal Fishing Charters, it can be very good depending on the time of the month you go fishing. The week preceding a full moon and around a new moon are the best days to fish for these spectacular game fish. Wahoo pound for pound might be the meanest fish in the ocean. The Atlantic sailfish might be the fastest. For sheer brute strength, the tuna might be tops. But for a savage strike at 50 mph and a brawl back to the boat the wahoo rules the blue water. When fishing for wahoo out of Ft. Lauderdale the method we like to use most is fast trolling. We like to use a variety of lures at all different depths. When you for these fish you also have a chance at other kinds of fish like dolphin, tuna, kingfish, and sailfish. Trolling in depths between 200 ft. And 400 ft. is very productive as is going over wrecks. When chartering the YB normal ask the captain if this is a good time for wahoo. Heavy tackle is used when targeting these fish be ready for a fantastic fight. Wahoo make great sushi and can be cooked many ways such as grilling, baking, and broiling. So when you come to Ft. Lauderdale to fish make wahoo your target.